Under the North American Wildlife Conservation Model, science and law are crucial pillars for wildlife management. Unfortunately, many wildlife managers are experiencing limitations that prevent them from securing the data they need. GOABC wants to help provide citizen science to improve population data. Guide outfitters spend a considerable time in the backcountry and, as a result, they know wildlife populations and habitat very well. Our Wildlife DNA Collection Program provides a way to harness this knowledge and time spent afield and is an effective way to secure important wildlife data. Members of GOABC who wish to participate in the program are provided with wildlife DNA collection kits. These kits are easy to use in the field and the sample cards are then mailed back to GOABC. Upon receipt the cards are catalogued and stored. In future the DNA samples will be sequenced to help provide insight into the health and size of wildlife populations in our province. 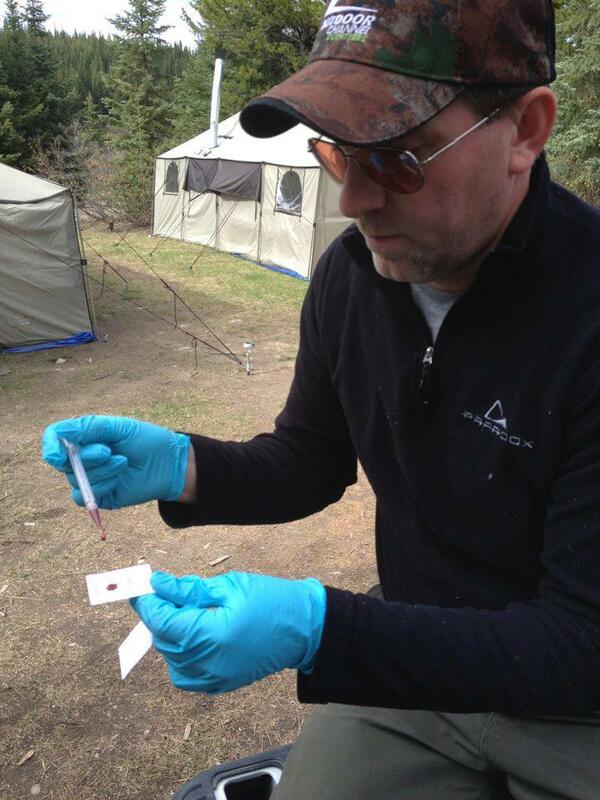 GOABC Past President Mark Werner collecting a blood sample for the DNA Collection Program.